Transitional Processes and Citizen Inclusion in Kenya and South Sudan: Local Perspectives on Sudtainable Peace, Audra Grant, Alexandra Calonbokidis, Melanie Meirotti, Grant Masterson, Maria Lausund & Jacob Juma 2019. This Case Digest compiles and synthesizes sixty of the IEBC Disputes Resolution Committee (DRC)'s decisions relating to the 2013 General Elections. It will be useful to especially the political parties and other key stakeholders in understanding electoral jurisprudence on resolution of disputes arising from Political Parties' nominations and Party Lists. 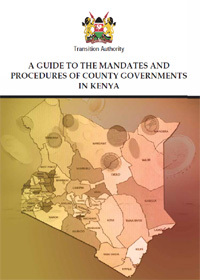 A concise manual which has meticulously put together the must know of the Mandate and Procedure of County Governments. The project to produce the Guide was initially conceived for the County Assembly, but it became necessary to expand the scope to include the County Executive and to add brief information on matters of general application in the devolved system of Government in Kenya. Provides timely and invaluable one-stop reference to the electoral reforms recently undertaken in Kenya. By relating to international best practices, Conventions and special interest groups in elections, the Handbook is expected to broaden the reader's understanding of election management and the institutionalization of democracy in Kenya and beyond. The wave of post-election violence and instability experienced in various towns involved a large number of the electorate who had voted peacefully on 27 December 2007. How did such an apparently exemplary electoral experience turn into a political fiasco?